Week two is almost over and it’s been a busy one! 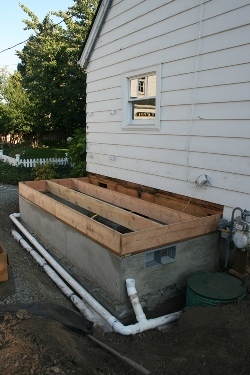 During week two, the foundation was poured and a drainage system was put into place. Although not one of the glamorous parts of construction, the drainage system is a key element for a successful design. Our drainage system took an entire week to install. As work on the drainage system continued, our carpenters began putting the floor system in. This floor system includes a lowered section where the tile shower will be. 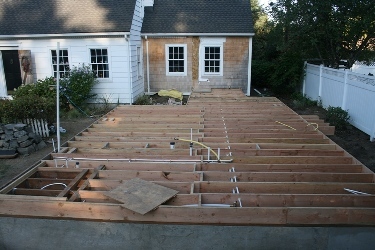 The shower, when completed, will have a smooth, no step transition, and planning for this was included from the start. As the floor system is set into place, the heating system is installed. A new heat pump for the whole house will be installed at the next phase of heating installation. During the “under-floor” stage, the new heat ducts for the addition are installed. We made sure to design the placement of heat registers under windows and doors, where air can become stagnant, and checked with the homeowner on future furniture placement making sure no new registers would be under beds or couches.